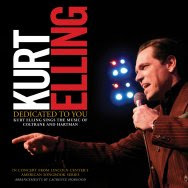 Kurt Elling's new CD, Dedicated to You: Kurt Elling Sings the Music of Coltrane and Hartman, is at the top of the JazzWeek airplay chart for July 6. I finally bought my copy today from the Electric Fetus, my LRS. I had been resisting the siren songs of iTunes and Amazon ("click me!") ever since the CD came out on June 23 because I wanted to drive to the Fetus, park in the lot, walk through the security pylons, pass the cards and T-shirts and soaps and stationery and Kangol hats, continue through the music that actually sells all the way to the north end of the store, take a sharp right and end up at the Jazz and Classical New Releases bin—the destination farthest from the door, unless you count the basement. Kurt was there, of course, and a few more temptations: Farmers by Nature featuring Gerald Cleaver, William Parker, and Craig Taborn, recorded at Stone; the Chris Morrissey Quartet's The Morning World; Fly's Sky & Country with Mark Turner, Larry Grenadier, and Jeff Ballard; and Irvin Mayfield and the New Orleans Jazz Orchestra: Book One, which I want to hear before Mayfield comes to town to play with the Minnesota Orchestra later this month. On the way home, I heard "All or Nothing at All" from Dedicated to You on KBEM. In mid-June, Ted Panken, that lucky dog, had a lengthy, leisurely, wide-ranging, far-reaching conversation with Elling about all sorts of things (including music, Chicago, God, poetry, the soul, Sinatra, Kerouac, KE's college days, New York, jazz, and Johnny Hartman). The interview is now up on jazz.com. Interesting and worthwhile reading for anyone who enjoys KE and his music. On the same day Panken's interview was posted, NPR featured "Lush Life" from Dedicated to You as its Song of the Day. Great pick but I wonder how well writer Marc Silver knows KE's music. Silver writes, in part: "Kurt Elling has a lot of gumption. On Dedicated to You, his new CD, he sings the songs of Johnny Hartman and John Coltrane, including the utterly iconic 'Lush Life'--which has been performed by not only Coltrane, but also Ella Fitzgerald, Chet Baker, Nat King Cole and even Donna Summers.... Elling doesn't seem intimidated by the song's stature." Why should he be intimidated? He can sing whatever he pleases, and he has pretty much from the start. One of the many things I enjoy about his live performances is the fact that he takes chances. He never phones it in. He's the Philippe Petit of jazz singers, jumping up and down on a high wire. I've thought that since I first heard him sing at the old Dakota many years ago. And again when I came across his recording of "Tanganyika Dance," his interpretation of the McCoy Tyner tune "Man from Tanganyika," for which KE wrote his own lyrics and which he recorded in 1994, when he was 27 years old, before his first CD as a leader (Close Your Eyes, 1995). Track that down and listen (it's on Bob Belden's Shades of Blue) and see if you think it sounds like someone who's risk-averse. KE: "It's a very different experience for me just to sing these tunes as opposed to, 'Let's stretch out, and I'll do this gigantic, obnoxious, vocalese thing.' For once, why don't we just bite off as much as we can chew, as opposed to more than we can chew?" KE: "I wouldn't have thought of it.... I wouldn't have thought to touch on any other than maybe to consider taking Speak No Evil and trying to write a lyric for all of it." Panken: "That would be a very different proposition." KE: "That would be a very different proposition. That's the way my head naturally goes, though. 'Let me bite off this gigantic piece that I can't actually do.'" I wonder what KE has planned for his "Passion World" performance at the Allen Room at Jazz at Lincoln Center next May. He's sharing a bill with French jazz accordionist Richard Galliano. And Laurence Hobgood, of course.